If you’ve ever played a video game and ever loved an animated Disney film, Wreck-It Ralph is the movie for you. A combination of old school arcade, new first-person shooter, and standard fairy tale recipe, it’s an adventure you don’t want to miss. It’s not as highly praised or conversed as Tangled, Frozen, or Inside Out, but it’s better than two out of those three. Actually, it was nominated for an Oscar for Best Animated Feature in 2013 and it currently has a 7.8/10 rating from almost three hundred thousand users on IMDb, so it’s not that obscure, but it still fades when exposed to the bright, sappy light of the Disney Princess genre. That doesn’t mean that you should let it slip away into the shadows though, far from it. You should see it, and I predict that you’ll enjoy it as well. In an arcade full of awesome games, Ralph may be the only character who feels awful. In his game, Fix-It Felix Jr, Ralph plays the villain. He destroys buildings, Felix fixes them, Ralph is tossed in the garbage, and Felix wins a medal. Not fair at all, especially for poor Ralph who really just wants to be a nice guy. So, in a search for a medal of his own, the big bully goes off through the terminals with the idea of earning a medal of his very own. A visit to a war against alien bugs action game might win him some prestige, but a trip to a candy-themed racing land brings only trouble. A girl there named Vanellope just wants to win, Ralph just wants a blue ribbon, and the king of the realm just wants everything to stay the same forever. John C. Reilly as Ralph is perfection. I can’t think of a better voice-over talent for this character, and Reilly manages to add much of his own lovable, unique, schlubby personality to the role. 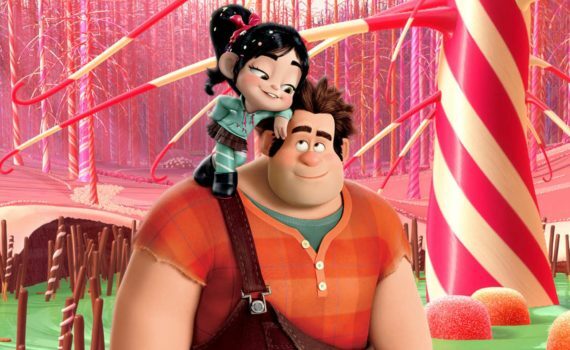 Sarah Silverman as Vanellope is equally well-cast, and the two play off each other very well. Alan Tudyk does a great Ed Wynn impersonation, Jane Lynch is a badass soldier, though I have to say I didn’t enjoy Jack McBrayer as Fix-It Felix. I did love the animation though, a wonderful blend of 64-bit and spotless modern digital art that was stunning throughout. Some good music, good morals, and a director who would go on to helm Zootopia; everything was lined up perfectly for Wreck-It Ralph to be a success, and it was. In case you let this movie pass you by, remedy that.